It is useful in citizen science projects to be able to have some simulated data so that you can measure how accurate the answers of the volunteers are. However, there are some projects where entering simulated data isn’t really a possibility, and Snapshot Serengeti is one of those. This image has had an animal added in by myself. Can you tell which one it is? 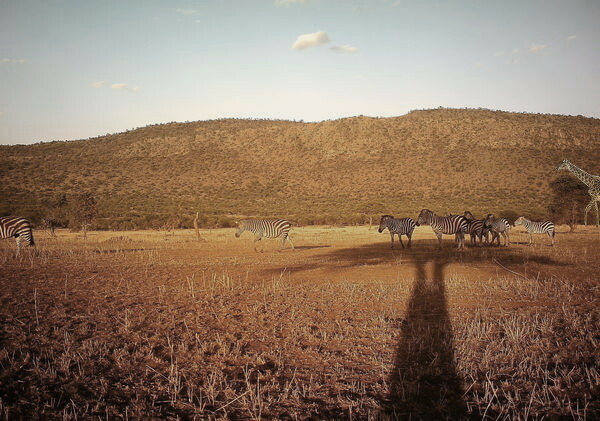 Is it the whitish zebra near the left? The ‘zebra’ on the right – between the herd and the giraffe – seems to have a very odd head … no mane, shorter than your average zebra, strange ‘cheek’, … Etc. But then the ‘giraffe’ is also odd … its feet seem to be saying it’s in the background (further away) that the zebras; if so, then it must a truly gigantic beast, no? Not to mention that its position – distance from the camera – in relation to the tree seems, um, curious. Actually, while analyzing the shadows is a bit fraught, they tell a *most* interesting tale … Photoshopping anyone?